Last time I made a novelty cake I got a lot of questions about how I did it, so here are the hows for the latest non-anatomically correct triceratops cake. I use Madeira cake as it is nice and easy to chop up into whatever shape you want. You can basically carve it if you need to, and this is even easier if you freeze it first. Also I tend to make a chocolate marbled Madeira cake to make it a bit more interesting. I haven't got this quite right yet...the Pingu cake was not marbled enough (tried to marble it in the tins and it was too thick) and this one was a bit over-marbled (mixed it in the bowl a bit too much). Still, practise makes perfect. So first of all, I constructed the cake, here's a photo of how...I baked three normal sandwich tin-sized cakes and had plenty left over to make a nice chocolate treacle tart later. The body is two half cakes sandwiched together and everything else is just carved out of the leftovers. This is the first time I have used butter icing to ice the cake. Let's face it, it's the best tasting icing there is, but it is a pain in the bum to get a nice finish. 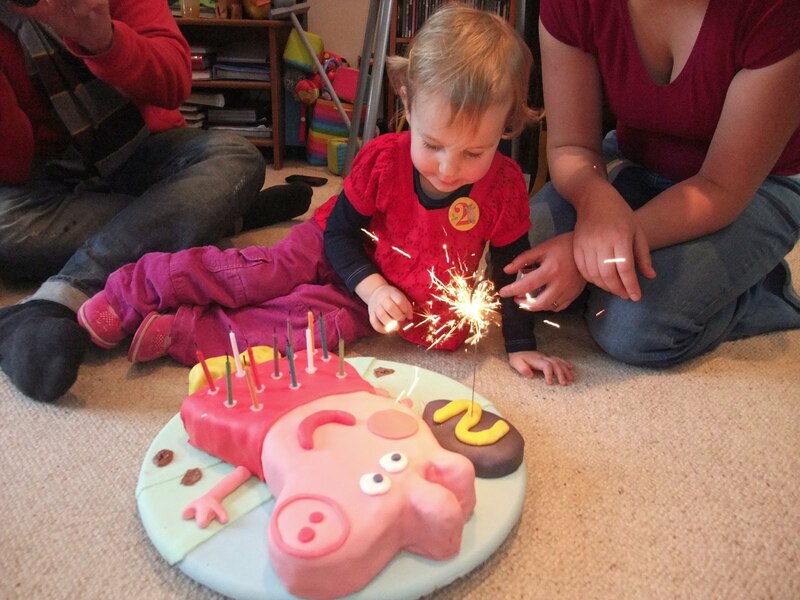 With Peppa Pig I iced with butter icing and then put that disgusting royal icing stuff on top. 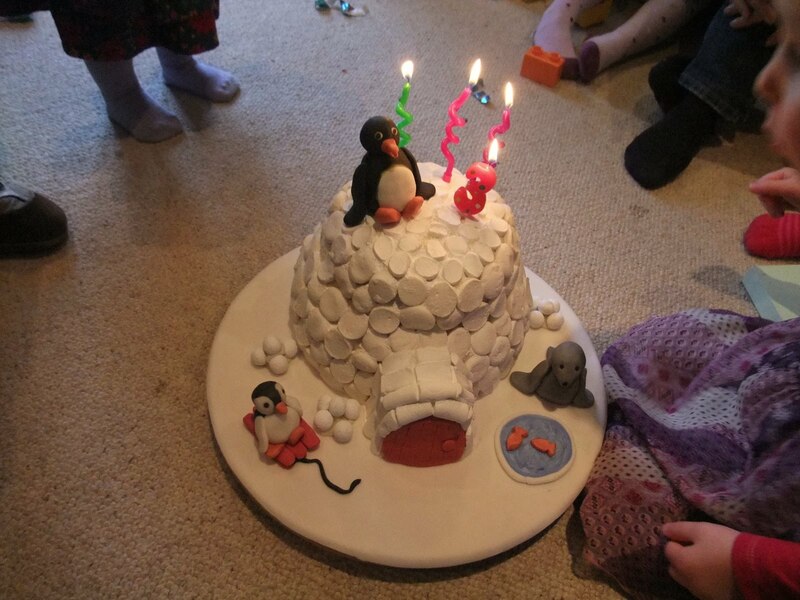 With Pingu the butter icing was topped with marshmallows. In this instance I had in my head to do a nice purple, but found the colour almost impossible to achieve. Maybe it is the food colours I have? I'm pretty new to this novelty cake stuff, has anyone got any recommendations? I went with blue white chocolate icing instead. Then my beautiful assistant was let loose with the chocolate to complete the look. It did require rather a heavy supervision to make sure some chocolate ended up on the cake as rather a lot seemed to head tummywards immediately. Still my only directions were for the three horns and the rest is her work. Then I just added white chocolate buttons for the toes and eyes, and piped on a little mouth. Here he is in all his glory. Couldn't get a nice shot really, but you get the idea. What happened to the chocolate treacle tart?